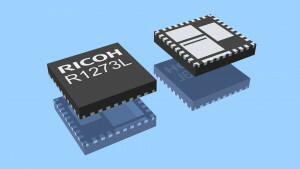 Ricoh Europe has launched the new synchronous buck DC/DC converter R1273L, with a wide input voltage range up to 34V and an adjustable output voltage range. The output current supports up to a maximum of 14A. The converter features an integrated controller and high- and low-side N-channel MOSFETs offered in a single package, allowing for small-sized and high-efficiency power supply designs. The R1273L is due to the high operating voltage and high output current – an ideal choice for advanced car infotainment systems. Using a unique current mode PWM architecture without an external current sense resistor, the R1273L proves to be a stable DC/DC converter with high-efficiency. To maintain high efficiency under light and heavy load conditions, the device switches automatically from PWM to VFM mode. Next to the automatic-switching mode, the designer can select another forced PWM mode and a PLL_PWM mode with external clock synchronization. The oscillator frequency is adjustable in a wide range from 250kHz to 1MHz by using an external resistor. The frequency can be synchronized with an external clock, which has the advantage to minimize noise issues when multiple DC/DC Converters are used in the power supply. Phase compensation can be adapted through an external resistor and capacitor in order to do optimisations for the inductor and output capacitor. The Under Voltage Lock Out (UVLO) function disables the chip below a minimum input voltage level, whereas the Thermal Shutdown function protects the device during an overload condition and disables it when exceeding a temperature threshold. The adjustable Soft Start Time provides, with use of an external capacitor, a smooth output voltage ramp up. The Output Over Voltage Detection (OVD) and Output Under Voltage Detection (UVD) indicate a fault signal when the output is 10% above or below the regular value. With the Over Current protection option the designer can either select a hiccup-mode or latch mode version, depending on the application requirements. Hiccup-mode over current protection shuts down the chip after detecting an over-current condition and tries to resume to normal operation after a delay time. Hiccup-mode protection is a more advanced over-current protection than other methods, as it will produce a minimum of heat dissipation during the chip off status at over-current condition. The latch-mode over-current will not return to normal operation automatically, but requires a chip reboot after removing the over-current condition. For EMI reduction, a Spread-Spectrum Clock Generator (SSCG) for diffused oscillation frequency at the PWM operation is available as an optional function. R1273L is available in a compact QFN0505-32B package. Ricoh Electronic Devices Co., Ltd. (REDC) recently expanded its product portfolio, now consisting of three main categories: Consumer, Industrial and Automotive. All high-reliability semiconductor devices passed a 25°C test for consumer use. The products for industrial and automotive applications both passed in addition a high temperature screening and reliability test with extended hours. REDC ranks its automotive products upon purpose: Safety-critical parts, General equipment or Accessories. Most automotive devices (except the latter category) passed a screening at low temperature as well and are or become AEC-Q100 compliant. REDC offers a Product Longevity Program (PLP) for applications with a lifecycle of 10 years or more.